This is significant. The hashtag #Thisisacoup is trending massively on Twitter, leading Hugo Dixon, a keen observer of the Greek crisis, to suggest that the Eurozone in general is losing the blame game big time right now. These were lines I drafted at 2 a.m this morning, when a deal seemed far away. Even der Spiegel had turned against the German government with an article entitled “Proposals of the Eurogroup: The Catalogue of Cruelties”. 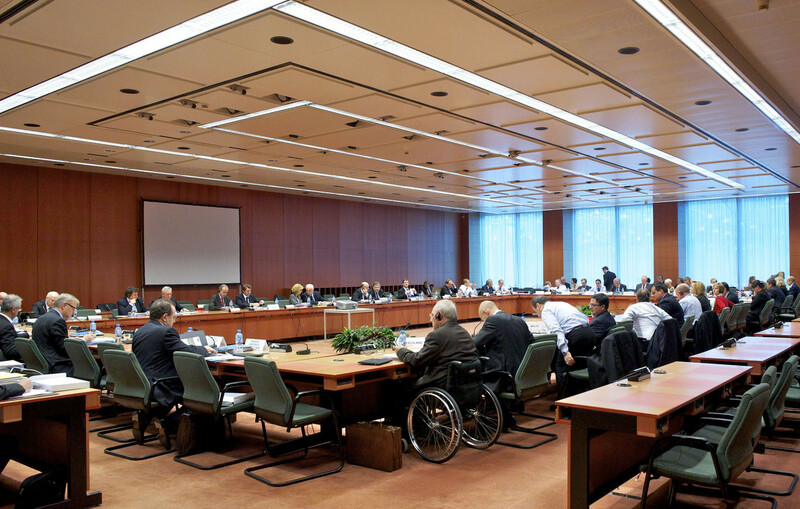 The German weekly suggested that the new demands emerging from the Eurogroup were nothing short of humiliating, with Greece having been given a long list of things to get through Parliament before Wednesday, a list of conditions that were never required before, and which are called ‘minimal’ in the sense that they are necessary just to get negotiations started with no clear promise of a result. For completeness, I should also add that der Spiegel has followed up with more critical articles this morning, before returning to its bland and impartial attitude later in the afternoon. Gems from this morning are an article entitled “The Stomp March of the Creditors”, and sentences in its column like “The federal government has destroyed, in one weekend, 70 years of post-war diplomacy” or “For that which has been decided there is no-one in Greece who supports it. It is the program of an enemy force”, as well as “The political consequence is to damage Tsipras. I assume this was also the goal. […] there remains only the choice in Greece, between a communist party or Golden Dawn”. Forget all the hubris about a ‘deal’ having been struck. This was a most acrimonious process exposing deep rifts within the Eurozone. Tsipras, for the most part, was condemned to the role of a spectator. It is difficult to see how the powers that be can backpedal from such a massive attack on the political or financial sensibilities of a viable deal. Bloomberg summed it up thus: “EU Demands Complete Capitulation From Tsipras”. Zerohedge, probably the most widely read blog for the hedge fund industry, published an article with the title “How Fascist Capitalism Functions: The Case of Greece”. Both media channels are known for being both balanced and neo-liberal! Last night, it was Media across the board who suddenly changed their tune when Germany and others had moved the goalposts beyond reason on Greece. Note, the whiff of ‘fascism’ was making it into the headlines of a reputable site. Tsipras never had an option than to bring the full list of demands to the Greek parliament. He could not walk away, as this would mean disowning his own parliament of a monumental responsibility. Perhaps he had the option of withholding judgment or recommendations on how PMs should vote. But for all the Syriza radicals, I say that walk out he could not. The ultimate decision has to rest with the Greek parliament. If he were to nail his colors to the mast and walk out, Greece’s polity would be destabilized beyond repair. The media and twitter show that Germany is taking substantially more reputational damage than its leaders may expect, and rightly so. It is totally unacceptable that this is being played out on the back of Greeks. What it really is about is which kind of Europe we want. Schaeuble, under tremendous pressure from the media and the public, changed tack later last night and a ‘deal’ was celebrated this morning, but the sour taste will linger long enough to make the medium-term future of the Eurozone most acrimonious. It will make any future agreement on any nation in distress a political powder keg. Europe has suddenly been exposed for what it is: A union of self-interested, anti-solidarity, and racist bigots on the one hand, tempered by some who try to keep the spirit of Adenauer, Bech, Beyen, Churchill, De Gasperi, Monnet, Spaat, and Spinelli alive. It seems we haven’t learned the lessons of the 20th century, that Germany should have never given the power that the EU handed to it on a plate. We are about to remember this lesson, or so we must hope, that it will be German dogma, which has been allowed to spread in the public through a mis-informational propaganda machine, that will break other nations’ will for ever-closer-union. People like myself have to re-calibrate their view of the financial calculus that is happening in Germany and elsewhere. I am now forced to recognise that it is not true that Germany stands to lose a lot more from a Grexit than from a bailout. Anyone who bought into this argument would have to conclude that Germany stands to lose even more from an acrimonious divorce. Very clearly, this is not Schaeuble’s calculus. Even for advocates of a Greek exit, the — in der Spiegel’s words — cruel way it may happen should be the worst for both Greece and Europe. But the financial calculus is different. Schaeuble doesn’t mind an acrimonious divorce in the least: Germany and others need a weak union, a dysfunctional currency, which produces economic laggards they can blame, in order to drive forward the engine of their own growth, which is a weak currency. Never mind that such un-earned growth produces precisely the inefficiencies, social rights, and structural problems that the North criticizes as being present in the South: As long as a weak currency can power the economy, all these untruths remain hidden. Unions in Germany are much more powerful than in Greece or Spain, employment rights of the German worker are incomparable to those in Greece and Spain in practice. It is racist slander to pretend otherwise: Where are the German workers migrating to Greece because their labor-law protection is so comfortable? Where are the Greek students taking gap-years and then returning because they know that three jobs are waiting no matter what? Of over 10 countries where I have had the pleasure to manage people, nowhere was the labor-force more unreasonably protected than in Germany, with predictable results: Whenever you were unlucky enough to deal with someone who is naturally lazy or self-centered and you lack the tools to bring them in line, the culture of the place suffers. Many times I wondered why the German economy works as well as it doesn’t, with those parameters. The weak currency is a substantial part of the answer: Only 15 years ago, Germany’s economy was called the sick man of Europe. It is still structurally sick, but the euro is hiding the fact, and the euro laggards are making Germany’s anaemic growth look good at least by comparison. All rather handy for a finance minister who needs to score points back at home. There would have been valid intellectual reasons which Schaeuble and others could have used to argue for a Grexit. The fact that they prefer to hand Tsipras a gun rather than calling for a well-ordered exit shows they are not concerned about planning for “the day after”. The reasons for this are more cynical than a pure desire for humiliation: They are to do with Schaeuble’s desire for a weak Euro and a weak Eurozone, as spelled out in my previous post. An orderly exit would not be helpful to his dream of a German power-house based on protestant ethics, humiliating the lazy and backward Southern races, so that he can have his weak Euro. He’s a better general in the global currency devaluation wars than Draghi with his expanded asset purchase programme. No wonder zerohedge calls it fascism, bent on producing either Grexit or bail-out, as long as we get the worst version of either. What everyone should always have been afraid of is happening right in front of our eyes: a currency union which has unjustly conferred economic might on Germany is leading Germany to ruthlessly use it to its own advantage, never mind the social, political, and humanitarian cost elsewhere. Schaeuble’s and others’ assertions that Greeks are lazy and Greek governments are dishonest should be seen for what they are: ethnic slander of precisely the kind that has provided the cultural foundations of the worst humanitarian crimes in the 20th century, perpetrated by the same nation today (to boot, a nation which was given generous debt forgiveness by Greece and others when it was done with its crimes). Someone needs to stop this. The psychological damage to Europe, done in these meetings cannot be undone, irrespective of the ultimate outcome. Let me also speak to the problem of ‘trust’ which was writ so large in these meetings: Let’s please send a German politician there for a semester and try to govern it. It’s not the will that Greeks are lacking, but Greece needs help with the tools of governance. At the same time, by God, Germany needs help to find back to its humanism. Lest you think I am ranting, here is what Schaeuble demanded at 2 a.m., amongst other things, before he was put back in his box: A €50bn trust fund to be funded by Greek state assets. for the benefit of creditors just to get discussions started! Greece would have given away €50bn of assets just in the hope that maybe there will be another bailout. There is much relief about the ‘deal’, and that the final purpose of this trust fund is to benefit Greece in the first instance. But I ask, how can we forget what cruel and cynical cards Schaeuble played? He has exposed himself as a true anti-European. Zerohedge’s term of ‘fascism’ is not too much off the mark. This ‘deal’ has only losers, and the way we got there will have left its mark on many political processes in Europe in the following years (not least when Britain faces its referendum). Greeks are starting to openly ask the question whether they really want to be in a currency union that works on such parameters. Perhaps not. The pain and the hurt is becoming very personal. But I think Greeks would be wise to wait how the dice fall in Brussels in the long run. The disaster that is unfolding for them may yet flush out more friends in Brussels. Europe may sacrifice Tsipras and a few of his successors, but (a painful) time is on Greece’s side. A Grexit right now can only occur on unfriendly terms, and this would be the worst option. A Grexit on friendly terms, when it can be achieved and Greeks want it, may in time turn out to be the best. Brussels will have woken up to the fact that the current currency union is not sustainable. If it does not find a better one, future governments will emerge sometime in Greece (and elsewhere) which will get voted in on the premise of saying no to the Euro, and not just on the basis of saying no to hard times. That will be the time to go to Brussels and ask for ‘a better deal’. Brussels may be only too happy to oblige. Karl, even though I’m German myself, I voted “Yes” in the poll above. I’m afraid, however, that your case is not aiming at the real heart of the problem. Mr Schäuble – even though admittedly playing the prototype of the ugly German with his current approach – is just representing the attitude across whole Europe towards what the politicians call the “European Project”. In Germany but also elsewhere on this continent people at the bottom of their hearts don’t consider themselves as Europeans in the first instance. They are first and foremost Germans, Finns, French, Italians – or Greeks. And only thereafter they feel connected to Europe, somehow. It’s not like in the US where you have a national identity dominating local patriotism. Moreover, in all European countries the politicians in power are elected (and rewarded!) only by their respective sovereign and not by a potential European public. In a deep crisis this is certainly not enough: everybody is closer to their national shirt but never to their European skin. In my opinion this is the true engine of what we have seen here. Although granted: the attitude of the German FinMin has been quite a disaster so far. So indeed, the events which unfolded in the past 6 months and their most recent climax was an eye-opener for me as well. I always thought that the EU was in fact slow in its integration process but would eventually succeed one way or the other. The last weekend has left me in deep doubts about that. Unfortunately there are currently no visionary European politicians on the stage who could guide the continent into a better, brighter and more sustainable future. Take this together with the complaints of the other FinMins that he was only “lecturing” but never presented “concrete plans”. This indicates that the Tsipras/Varufakis team was completely out of their water depth. Varufakis especially seemed to be unable to understand how to talk politics. Probably he would have been a good advisor to a political FinMin. But most likely he only raised “questions too complicated” for Politicians. Clearly he got on much better with “technocrats” from the IMF. It seems they really believed they could convince their counterparts with arguments (and yes their arguments are good and most likely correct). This also explains why they did not prepare the “Grexit” themselves, which is totally good-hearted and OK for a professional tree-hugger but not good for a goldfish deciding to swim in a pond of piranhans. That’s probably also why they had nothing new prepared to present to EU FinMins the day after the referendum. They lost momentum and then let it be taken away completely by Schaeuble with his “Grexit” suggestion. Note what lesson Schaeuble tought them about Game practice in contrast to Game theory! So the upshot is that they simply are no Politicians. This is why they get elected in Greece where people are fed up with such folks. But they simply don’t have what it takes to negotiate successfully with real Politicians.